I think I speak for all of us when I say our rooms would look so much nicer with a Shearwater poster up on a wall. Why haven't they produced anything for our consumption! This is untapped merchandise right here. Imagine how beautiful this picture would look as a poster with Shearwater across the bottom! Those two examples aside, I agree: It would be nice if they produced gig or at least tour posters more regularly. Yeah way to be sarcastic. Those posters are from Austin venues. It doesn't even have to have the City Name on it. 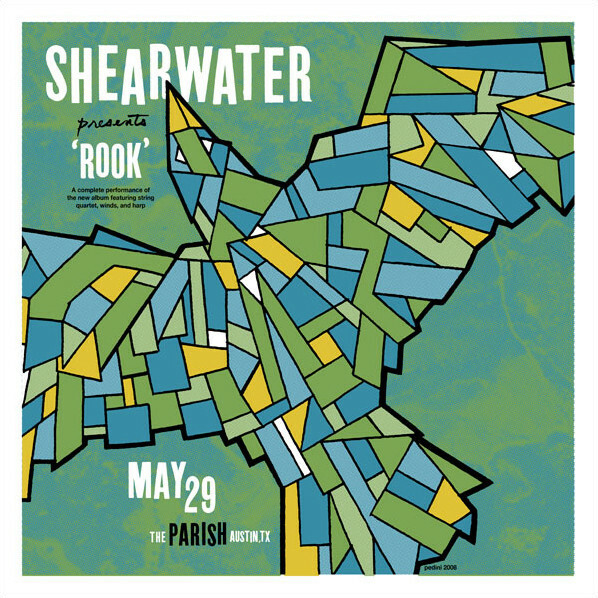 Just make a poster with Shearwater on it and I'll buy it. I'm talking to you Sub Pop! It wasn't sarcasm, it was pictures of SW posters. I think posters are going the way of physical media, at least for bands that don't appeal exclusively to teenage girls. It would be nice if they had more merchandise, but I don't think they can really spend money to make it. I will admit that the latest t-shirts don't really stand up to the old t-shirts, to my eyes, even if I'm a sucker for woodcuts. I don't think Shearwater get any money from the stuff Sub Pop sells, anyway. Sometimes I wish they had a more coherent aesthetic. You have the early stuff (photos of rooms), the mid-period stuff (drawings and photos of birds), then Rook, Golden Archipelago, and Animal Joy. Rook and TGA were on the same page visually, at least, and used the same fonts. Not to say that any of it's bad - while I'm still not sure about the cover of AJ, the rest of the art is the most gorgeous collection I've seen in years. But there's no single visual identity, and that confuses people. Then you have the videos, which are pretty thoroughly random. AJ's are a quantum leap from previous, at least, even if Immaculate still turns my stomach in places. Yearlings is still the only video that really captures the spirit of the music, though, in my opinion. You must not go to a lot of shows. I agree. There is so much potential in the artwork of the Island-Arc-Trilogy. I would just love to have the cover of Palo Santo or Rook in poster format. 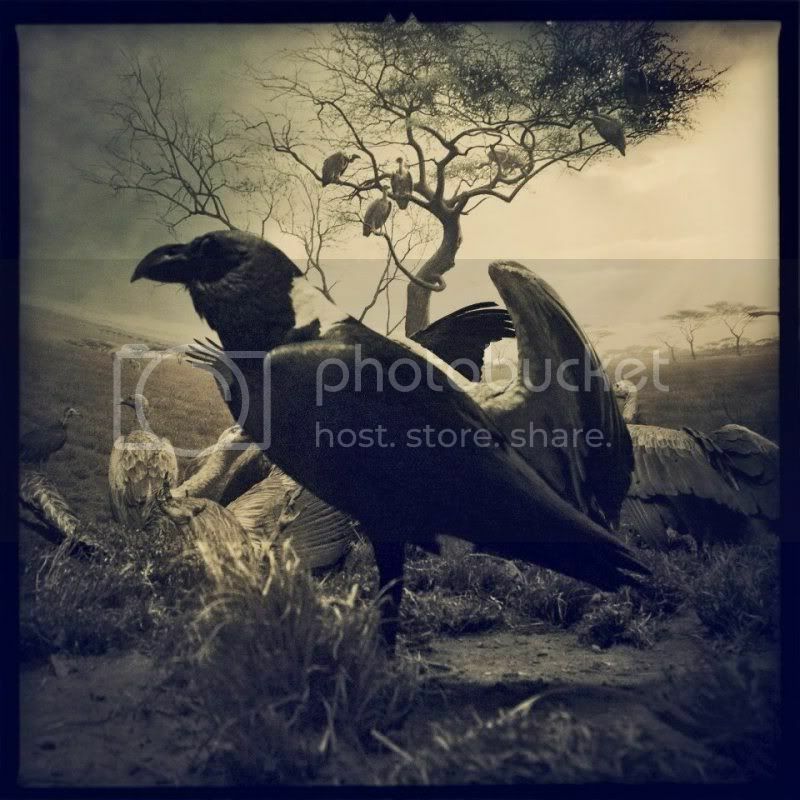 I would love to have a print of the Kahn and Selesnick artwork with or without Shearwater emblazoned across it. They....seem not to sell their artwork? At last not online. The only have hand-painted playing cards on their website (quite beautiful ones, but the kind of thing you'd want several of). Not that I'd expect them to have an Etsy shop, but it seems strange that there is no way to purchase any of these beautiful images. Anyone else out there ever tried to find their stuff online, or gone to one of their shows? I've adapted the Palo Santo artwork for my screen background. Looks cool. I'll email it to anyone who wants it. PM me. 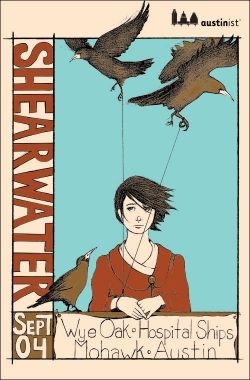 There were some Shearwater posters--that appeared to be K&S work--at Thursday's show (hidden away in the office, not the Dinosaur Jr + Shearwater fliers that were posted all over town), but I can't figure out where they were from. Because I looked and looked (and got all sneaky) and didn't find them before the show, but then after the set, that night's volunteers were coming up to have Jonathan sign them. There were only 4 or 5, so I wondered if they were limited promo for the venues, or if they were what came with vinyl (I still haven't opened my "Animal Joy," because I am without working turntable, and it would make me sad). My cousin went to that K&S show in OKC a couple years ago, and my friend Maria apparently owns some prints, but I don't know how to buy anything besides the playing cards (not that I can buy them! ).